1 Derek Parfit, On What Matters. Oxford: Oxford University Press, 2011: xxxiii. 2 Peter Singer, “Sidgwick and Reflective Equilibrium,” The Monist, 58:3 (1974): 490–517. 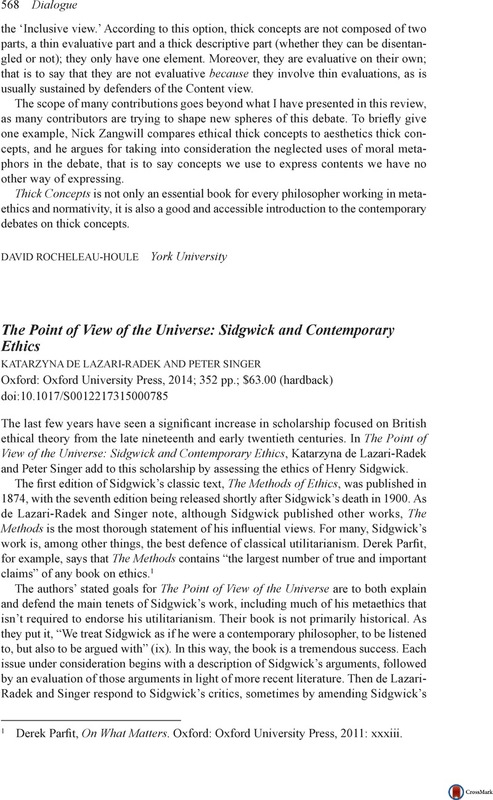 3 Henry Sidgwick, The Methods of Ethics (seventh edition). Indianapolis: Hackett Publishing Company, 1981 (1907): 131. 4 Derek Parfit, Reasons and Persons. Oxford: Oxford University Press, 1984: 501–502. 5 See, e.g., Feldman’s “The Good Life: A Defense of Attitudinal Hedonism,” Philosophy and Phenomenological Research 65 (2002): 604–628.